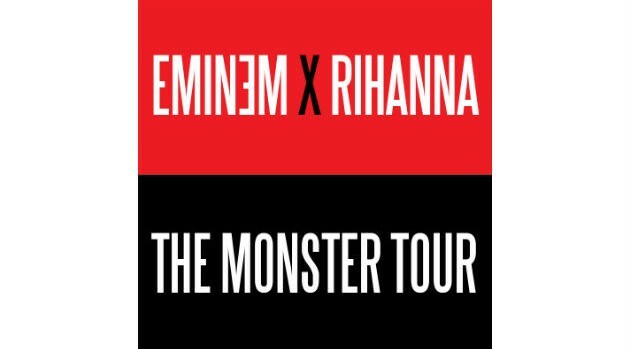 Live NationLast month, Eminem did an interview in which he revealed that he and Rihanna would be teaming up for a joint three-city trek called The Monster Tour, which would visit Detroit, L.A. and New York. Now, we’ve got the details. Em and Ri-Ri will rock L.A.’s Rose Bowl on August 7, New York’s Metlife Stadium on August 16, and Detroit’s Comerica Park on August 22. There will be an American Express Card member presale on Thursday, and a Facebook presale on Saturday. On March 27, Live Nation Mobile App users will be able to access tickets, and on March 28, everyone will be able to purchase them through LiveNation.com and the app, starting at 10 a.m. local time . Visit Eminem.com for all the information. Eminem and Rihanna have teamed up for two #1 duets: “Love the Way You Lie” and “The Monster.” You’ll hear those hits and many more at these shows.